Aaron was the first Dolphin owner to log on and register in the Forum. He is in Honolulu and has Yankee Dolphin hull #183. He says there is another Dolphin out there somewhere with him and someday we will find out who that is. Anyway, these are special Dolphins for at least one reason - until advised otherwise, they sailed out there on their own bottoms, joining Big Dot and maybe others for those honors. 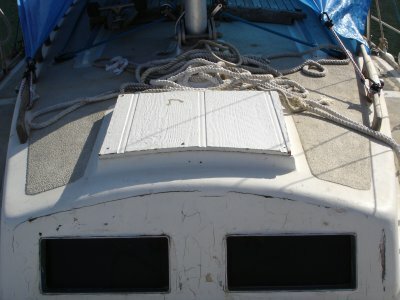 Aaron sent in the following picture to the Forum inquiring about replacing front hatches. But, while the hatch may require attention, we cannot take our eyes off the portlights! Aaron says this was a cut out section and replaced with the pair of portlights we see mounted in a plywood panel. I am certain this is unique in the Dolphin 24 world. Aaron goes on to say that this will probably need replacing soon as part of his project work on Flite. Maybe we can persuade him to keep the look - no pun intended. Any Dolphin that sails to Hawaii, has the name Flite, and has those two eyes looking out at you must have a story to tell. I hope Aaron can get it. Furthermore, I suspect the fear a knowledgeable leading boat's skipper always feels on the downwind leg with a Dolphin coming up on his transom can only be heightened with this pair of snake eyes watching his every move!!! Well, my hull just got rinsed out. 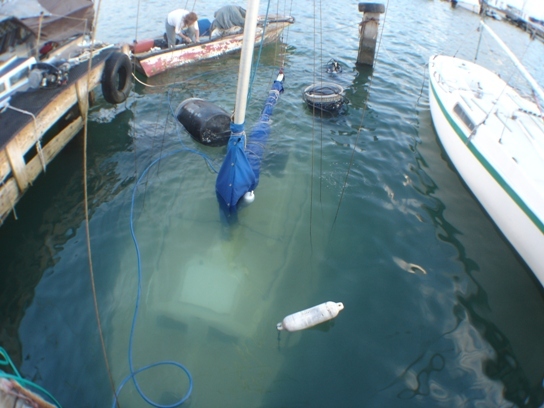 My boat (among several others in my harbor) went diving during a nasty little storm a little while back. Flite is now happily floating, and pretty much cleaned out better than it was. Damage is minimal, some paint rubbed off, lifeline posts slightly mangled, ripped out a couple of cleats, lost a few loose wood pieces to the sea. Nothing I can’t fix. At least I now have the credentials to make this recommendation: go now and make sure you have an operational automatic bilge pump and double check any questionable hull penetrations... mine has a valve that is stuck at 3/4 closed position. I suspect this was the major cause. The guy that sold me the boat said he put wood plugs in all the penetrations, I guess that one was overlooked. There was no crane. 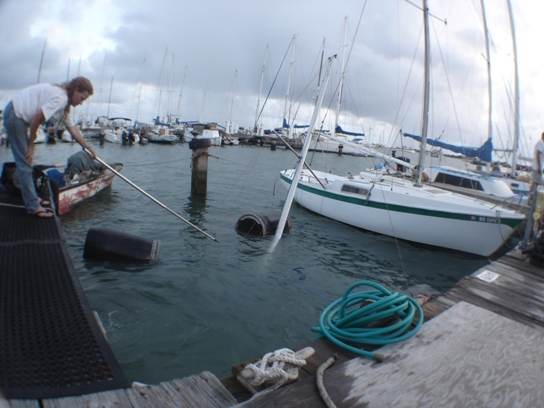 I hired a diver who sunk barrels (about 1 dozen) tied them to the boat, and filled them with air to get the boat up. 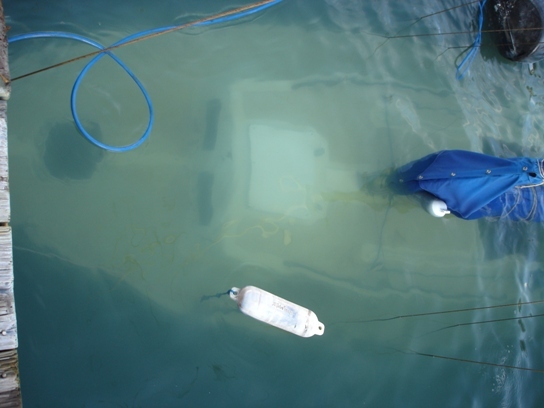 After the rail was above the water a bilge pump finished the job. Sounds simple, but it was about a 3 day long battle. The day after the storm the water was the color of chocolate milk - not so great for diving. It took a couple days for the swell to calm down and the water to clear. We actually ripped out a big piece of the finger pier during the process... the docks here could use some maintenance. Here are a couple of photos taken as she was being pulled up. Is this scary or what? Check those old seacocks!